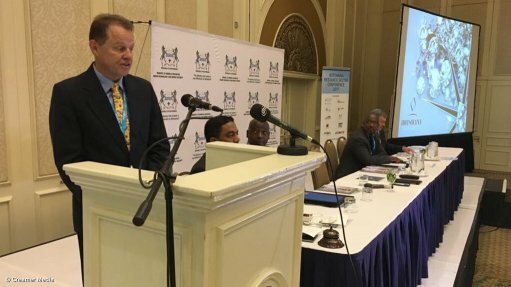 GABORONE (miningweekly.com) – The only way that Botswana can have a long and continued proud history of diamond mining is to spend money on diamond exploration, Botswana Diamonds MD James Campbell said on Tuesday, when he urged the country to consider adopting the Canadian flow-through incentive scheme to boost exploration funding. Campbell made this special plea for diamond exploration investment ahead of his prepared presentation, in response to the comment of Econsult MD Keith Jefferis that Botswana’s diamond mining industry had gone ex growth, and while the country’s diamond sector would not disappear, it would also not grow. “Unless people spend money on diamond exploration, that will be the case, and the one thing that is in short supply at the moment is expenditure on diamond exploration. “Botswana is one of the best countries in the world to spend money on diamond exploration, both because of political and prospectivity reasons, and the only way Botswana is going to have a long and continued proud history of diamond mining is to spend money on exploration. “I hope I’m preaching to the converted here, because money for exploration is in very short supply,” the former Rockwell Diamonds CEO, African Diamonds MD and De Beers executive said. During question time, Campbell took the opportunity to urge Botswana Chamber of Mines CEO Charles Siwawa and the government to consider implementing Canada’s flow-through scheme to put an end to the dearth of exploration financing. He described the tax incentive scheme pioneered by Canada as important in the light of the high risk involved in investing in exploration by companies like Botswana Diamonds, which is quoted on the London Aim and listed on the Botswana Stock Exchange. The flow-through share scheme, which entered the Canadian tax code more than a quarter century ago, has generated billions of dollars for mineral exploration by giving people who invest in exploration companies a tax break. “If individuals are incentivised to actually do that, it will grow the overall exploration industry, which will in turn benefit Botswana,” said Campbell, who was accompanied at the conference by Botswana Diamonds chairperson John Teeling. While Campbell applauded Botswana for awarding licences for diamond prospecting, he cautioned against the country doing so to people who did not have the technical or financial competence to undertake meaningful exploration. “That’s a concern because that basically sterilises that ground,” he told the Botswana Resource Sector Conference, attended by Mining Weekly Online. Botswana Diamonds has many diamond exploration projects in both Botswana and South Africa. “We have a very exciting diamond industry of falling supply and rising demand,” he commented. His company focuses its exploration effort on areas of Botswana and South Africa where discoveries made a long time ago have not been comprehensively studied using modern technology. At its Frischgewaagt project in South Africa, 223 microdiamonds have been recovered from 160 kg of kimberlite drill core, with the largest diamond a white transparent crystal stone in the -1.18+0.85 mm sieve, the company said in a release to Mining Weekly Online. The kimberlite concentrate was recovered from the nine core holes drilled on Frischgewaagt, where both magmatic kimberlite – associated with dykes – and volcanoclastic kimberlite – associated with pipes – were recently discovered. MSA undertook the microdiamonds analyses and Dr JJ Ferreira the modelling. A second drill programme is scheduled to begin next month at Frischgewaagt, which is on a 6 km kimberlite dyke/pipe complex averaging 1.34 m in width. The project is 2 km along strike from the Marsfontein mine, where a payback of capital was achieved in less than four days. Teeling commented on the excellence of the result at Frischgewaagt, where earlier work indicated diamond values of more than $200/ct and where an inferred resource classification is expected to be arrived at by year end.